WebBPoS is a web–based state of the art Point of Sale system that delivers the speed and flexibility needed for any kind of retail establishments with multiple sales counters. 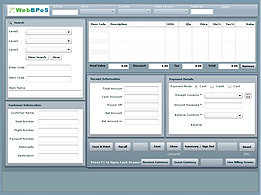 WebBPoS is designed to help retail businesses with keeping track of customers, items, and sales. WebBPoS extends companies to the Internet or Intranet and provides business owners with real–time decision–making information. WebBPoS has Procurement Management, Inventory Management and Billing modules and provides interfaces to financial accounting systems. WebBPoS is well integrated with POS hardware. Though it has thin client / web based architecture, the billing is developed as a Rich internet Application (RIA) to give thick client advantages for quick billing. – Privileged access to change Store / Counter / Pricing / Discounts / Taxes etc.